After spending my first year of university in catered halls of residence, I lived in a house with seven of my very best friends for the remaining two. A single oven, fridge and hob between seven meant certain limitations on our culinary exploits and sharing took on a whole new meaning. I’ll never forget the exchange between one friend who discovered that the lasagne she’d lovingly made to share with her boyfriend had mouse-like nibbles taken out of it and the other who – more night owl than mouse – had drunkenly dug into it the night before and then promptly forgot. Having lived in this flat for nearly five years, it’s hard to remember how I could bear to share a kitchen. Our tiny space doesn’t accommodate two people side-by-side all that easily which means I mostly get it all to myself, and although the cupboards and fridge might look like chaos to some, it’s the organized kind and I can (almost) always find what I’m looking for. As of next Monday, I’ve got to learn to share again – for a few weeks at least. A team of builders is coming to rip out our kitchen while Carnivorous Husband and I decamp to my parents’ house. My parents’ kitchen is beautiful, and more than big enough for all four of us to stand side-by-side, so hopefully I’ll find some new inspiration to share in this space while we’re there (even if I do have to contend with a cantankerous gas oven and my precious stand mixer is in storage). And then, before Christmas, we’ll be back home to a brand spanking new kitchen and all sorts of exciting delights: a fridge big enough to hold ingredients for more than three suppers; a pan draw; a work surface large enough to roll out pastry properly and a ceramic sink (that I’ll probably chip the first time I do the washing up. but which will look all kinds oh-so-professional that I won’t care). I’m excited. The recipe I’m sharing today is something you can make in any kitchen, at any time, regardless of what equipment you have or even the time of year. 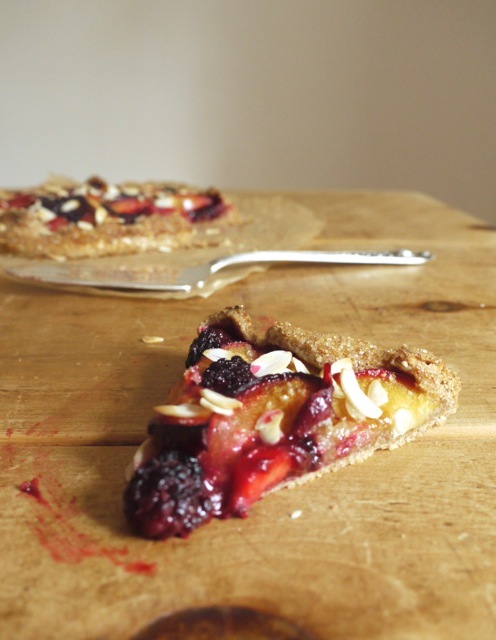 All you need is a favourite pastry dough and some seasonal fruit, then forty minutes later you’ve got an oozing treat of a tart. It’s autumn here so I’ve used blackberries and plums, but in summer some cherries, nectarines or strawberries can take their place; even some frozen fruit if that’s all you have access to. The pastry is my favourite at this current moment in time – flaky with butter and nutty from wholemeal flour. I made a sort of fat-free frangipane to sit under the fruit to soak up some of the juices and keep the pastry crisp, which seemed to work well, becoming part of the fruity filling as it baked without being heavy. A final sprinkling of sugar adds extra sweetness and crunch: I’d add this by instinct, depending on how ripe your fruit is. Delicious served warm with a big scoop of ice cream or a blob of crème fraîche. Here’s to exciting new projects – have a wonderful week. 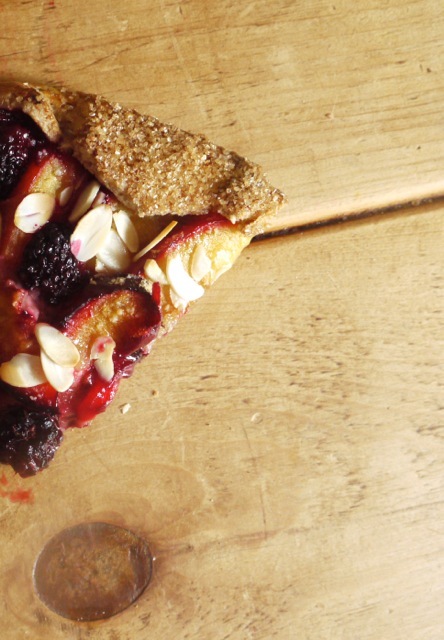 A simple free-form tart filled with softly baked blackberries and plums. The wholemeal spelt pastry is nutty and crisp with the crunch of demerara sugar and toasted flaked almonds on top. Perfect for an autumn dessert, served warm with creme fraiche or ice cream. A few minutes before you want to make the pastry, place the butter in the freezer to firm up. In a large bowl, combine the flour, cinnamon and salt. Remove the butter from the freezer and coarsely grate into the bowl of flour. Using your fingertips, rub the grated butter into the flour to form a shaggy dough - some little pieces of butter, about the size of your little fingernail, are fine. Add the vinegar and 5 tbsp water, mixing quickly to form a ball of dough and adding a little more water as necessary. Flatten the dough slightly, wrap in cling film and refrigerate for 30 minutes. To make the filling, blitz the almonds with 1 heaped tbsp demerara sugar and the wholemeal spelt flour until coarsely ground. Halve the plums, remove the stones and cut into slices. Remove the dough from the fridge. Line a baking tray or board that will fit in your oven with baking parchment. Roll the dough out directly onto the baking parchment to a circle approximately 30cm round, dusting the rolling pin with a little flour if you're worried it will stick. Scatter the almond mixture over the round of dough, leaving a gap of 3 - 4cm all the way round the edge. Arrange the plum slices in concentric circles over the top, tucking the blackberries into any gaps. You want the blackberries pushed down slightly otherwise they could burn in the oven. 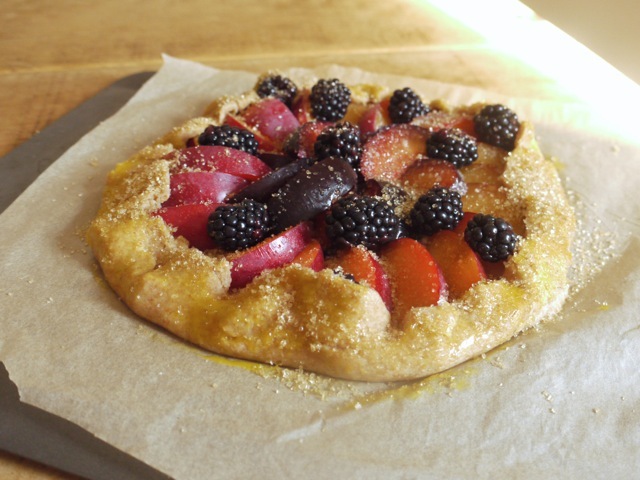 Tuck the pastry over and around the fruit to form a crust. Refrigerate the galette for 30 minutes. Preheat the oven to 170 degrees C fan assisted oven. If you have a baking stone, pop it in the oven, otherwise a baking tray will do. Remove the galette from the fridge and brush with a little egg yolk. 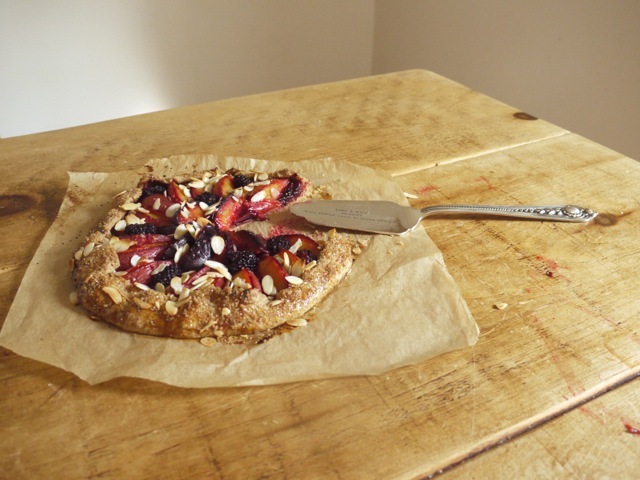 Sprinkle with the remaining demerara sugar (adding a little more if your fruit is particularly under-ripe) and flaked almonds then transfer to your pre-heated baking stone or tray. Bake for around 40 minutes until the pastry is crisp and golden and the fruit bubbling and soft. Remove from the oven, allow to cool for a few minutes, then serve warm in slices with creme fraiche or ice cream. Perfect for Autumn and for adapting to whatever fruit one has at home. I can imagine it with roasted quinces, some mulberries and with different types of apple. Oh exciting times indeed. Who amongst us food bloggers wouldn’t love a new kitchen? 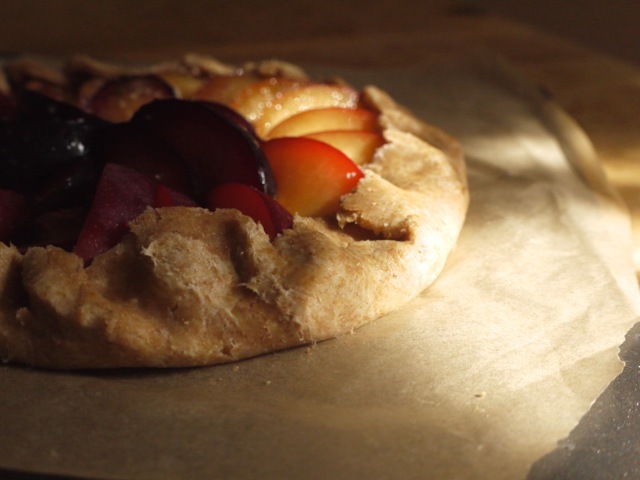 As for that galette – wow! It looks fruity and beautiful; pretty much anything with pastry gets a thumbs up from me. Looks so good Autumn food compensates the change in weather. Pheasants soon , joy! 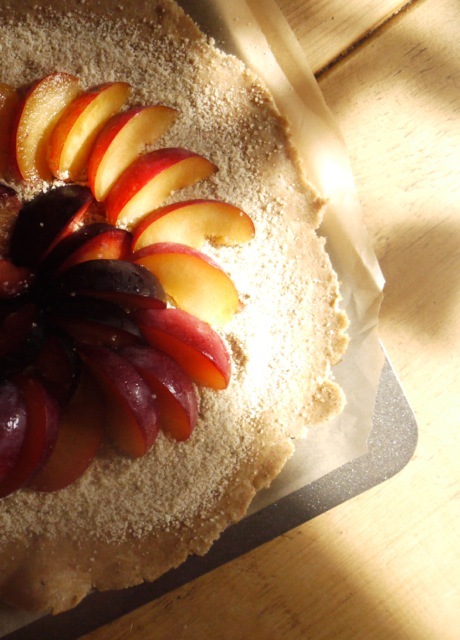 I have always wanted to make a galette – I think this is the prettiest one I have ever seen! These kinds of desserts are the best – I love the flexibility and simplicity. Congrats on the new kitchen! Oh, I hope your kitchen reno goes well and according to plan…. we went through one two years ago and it was hell ….we lived in our basement for 8 months… and moved back upstairs months after we were supposed to…. December 22 it was finally …. just in time to make a small chicken in my new oven….. whew…. I almost thought I’d have to buy a cooked chicken from Safeway for Christmas dinner…. thanks for this delicious looking galette…. 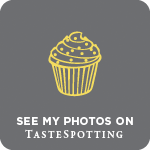 I’ve just stumbled across your blog and have absolutely no idea how I haven’t done so before?! It’s a delight; your writing is lovely, your pictures are beautiful, and I TOTALLY feel you on the kitchen thing. My kitchen at uni was less than half the size of the one I have now, and I shared with it double the people, and looking back now I don’t know how I coped. Also I’ve got half a tub of creme fraiche in the fridge that needs to be used up and, well, I guess that’s as good an excuse as any to make this tart, right?! I had two extremes of student kitchen sharing – it was nightmarish for the first couple of years, with washing up always needing to be done and treats always pilfered from the shared fridge, but in my final year I shared with a girl who is one of the greatest cooks I’ve ever known so it was a total dream and I learnt a lot from her. Plus, we had a dishwasher. 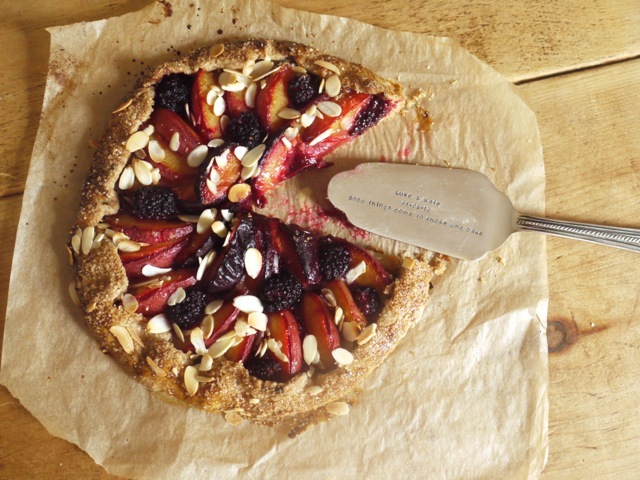 This tart looks like exactly what I need right now – I am carving out some time this Sunday to make a galette for sure! There is nothing more exciting than a new kitchen! I can’t wait to hear all your new space (and, having bought a massive fridge last year, I can’t tell you what a difference it makes!). I can’t wait for a time when I have a kitchen bigger than 5 steps from one end to the other. This galette looks so beautiful. 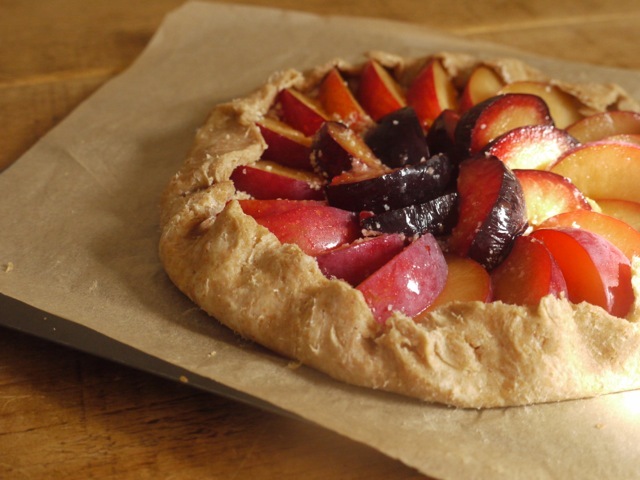 This galette looks really delicious, will have to try something similar! Hi! I really love the look of this tart! I was wondering for the filling, is it 2tsp and 1 tbsp of the spelt flour or 2tsp and 2 tbsp? Thanks!